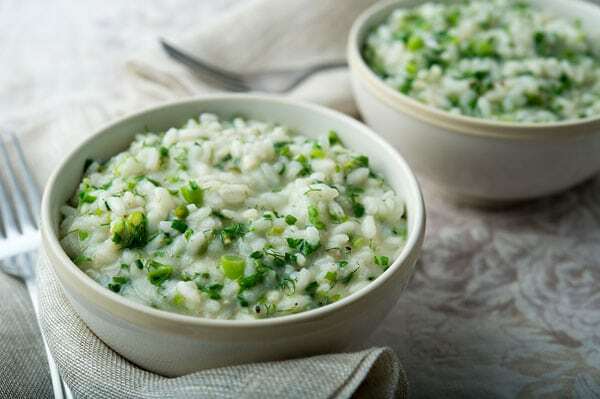 Risotto is an Italian style of cooking rice that, when properly done, will give you a bowl of creamy goodness without the use of actual cream. What you do beyond cooking the rice is up to you. 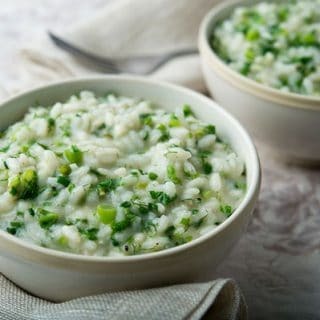 There are meaty risottos, mushroom risottos, seafood risotto, and any number of recipes that feature seasonal ingredients. This ramp risotto highlights the fresh green things of spring. Onions and garlic are the backbone of this dish. Specifically green onions and young garlic. Any sort of green onion works, from regular scallions to wild ramps, “lawn onions,” nodding onions, you name it. Fresh garlic, whether the pretty green garlic of earlier spring or what’s ripe now, which is fully formed garlic that has just been pulled from the ground. These fresh cloves are crunchy, and the flavor is warm, not biting or astringent, as old storage garlic can get. Beyond that, toss green things into this bowl of rice right at the end of cooking. Any green will do, but this is a good place for wild greens, like lamb’s quarters, dandelions, wild lettuce, amaranth, orache. But spinach is a good alternate, as are turnip, beet or mustard greens. Chard will work, but kale is too burly. My strong advice is to take your time when you cook the white parts of the onions, as well as the garlic. Slowly sweating the vegetables in butter helps them meld seamlessly into the rice. If you cook too fast, they will brown and discolor the risotto, or too short and they will be crunchy, which is off-putting. If you’ve never made Italian risotto, I urge you to try it. It’s not like any other rice you’ve probably ever eaten; only Chinese congee comes close. Silky, yet the rice has a distinct bite. Creamy, yet there is no cream. Warmth and softness is balanced by the herbiness of all those greens. A meal in a bowl, yes, but also a perfect match for grilled poultry or fish. 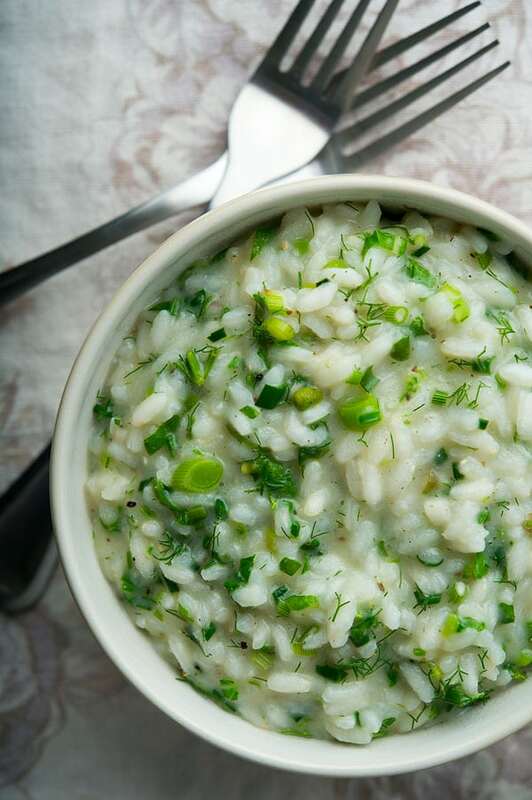 The point of this rice dish is to add fresh, green spring vegetables to the dish. The result is creamy, rich rice brightened up with the green things. I used Sierra Nevada wild onions and wild fennel, but any green onion, as well as chopped green leafy thing will work. 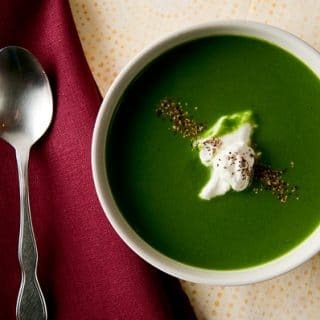 You might also want to toss in some fresh peas or fresh green fava beans. For the onions, you need to separate the white parts and the green parts, and you need about 1/3 to 1/2 cup chopped white parts. Heat 3 tablespoons of the butter in a pot over medium heat. Cook the white parts of the onion in the butter gently, stirring often, until they are soft but not browned, about 6 minutes. Add the garlic and cook another minute. Add the rice and stir to coat with the butter. Cook over medium-high heat a couple minutes, until the rice gets a little bit translucent. Add the white wine and stir well. Sprinkle some salt over everything. From this point you need to stir pretty much constantly. When the wine has almost boiled away, add the chicken broth and repeat the process. When the chicken broth has almost boiled away, add a cup of water and repeat the stirring while the moisture boils away. You will likely need to do this at least 2 more times. Taste the rice after the second cup of water has mostly boiled away and add salt if needed. You want the rice to be al dente, not mushy. When the rice is almost done, stir in the chopped greens and the chopped green parts of the onions. Add a little more water -- you want the rice to be almost like oatmeal in consistency, more of a porridge than set-up rice. Add the fennel fronds and the grated cheese. Finally, right before you serve, stir in the final tablespoon of butter and adjust with a little more water if need be to loosen up the rice. Serve at once. I serve this as a vegetarian main course, but it's also a good side dish for grilled meats or fish. If you're looking for something to drink with it, go with a white wine or a Belgian wit. You can find lots of recipes for ramps and other wild onions right here on Hunter Angler Gardener Cook! My favorite thing to do with spring onions, or “lawn onions” as you describe here, is to use them in my grits. I only use the green tops. I never dig up the bulbs and even then I only cut off 1 leaf from each onion plant. I also don’t mow the onions but let them eventually bolt and produce seed. I collect the seeds and scatter them in a better place – where I’m less tempted to mow them. Currently touring Croatia. Wild onions. So many that you can smell them as you walk through the forest. They make a lovely risotto.